Business is tough, when you’re in a competitive industry it’s even harder. But, the duo behind Matshaya Media is determined to push through to become marketing and tech giants. Sibulele (25) and Ntomboxolo (24) are determined, young entrepreneurs, bursting with innovative ideas and a commitment to their vision. Matshaya Media is a marketing and IT company based in East London launched in February 2018. We sat down with Sibulele and Ntomboxolo to discuss their journey as entrepreneurs and where the two are headed. The decision to resign and leave a constant salary was not an easy one for IT graduate Sibulele. He knowingly took a risk to venture into business even though he had the responsibility of his daughter. He has always been passionate about entrepreneurship, but, like most of us, when he graduated from his IT diploma, at CTI in 2015 he had to look for work. After getting a job at Vodacom as a technician his excited was short-lived when he did the math. He jokingly remembers calculating how much the store made in a day, “In one day, the store can make enough to pay for rent and our salaries, and the other 29 days are just profit”. So, he challenged himself and started his first business venture with his brother, Code Black Studios which focused on coding and animation. He tried for a second job at Silulo Technologies, where he met his business partner, Ntomboxolo, and East London raised young woman who was also a graduate of the same institution. In his work as the café manager, he started helping entrepreneurs and he realized he could do this on his own. As fate would have it, they were both two dreamers ready to start something big. Ntomboxolo says she wants their business to be a beacon of hope so that other people can see that you do not have to old and established to make your dreams come true. Sibulele says by no means does he romanticize entrepreneurship, it’s hard and frankly, it takes guts leaving the comfort of a salary for the unknown. His philosophy is simple; we cannot be like our parents always providing labor to businesses. “We need to be our own employers, otherwise we’ll never see any real development in our black communities”. Starting out was a challenge, initially, Matshaya was a subsidiary of Matshaya Investments an already established company. “In order to qualify for jobs and tenders, your company would have had to be operational for a year. We were fortunate to have an investor who incubated the business and gave us space to work in his house”, say Sibulele. 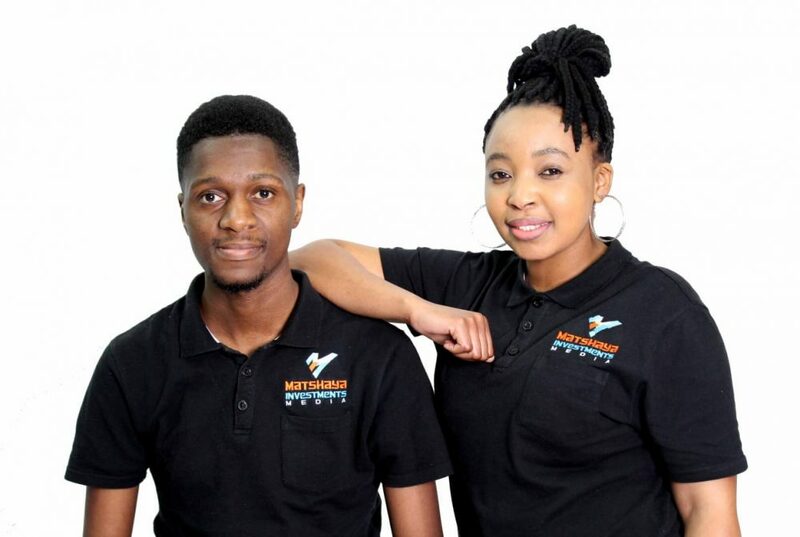 As young as they are, Matshaya Media boats a growing clientele including 240 Enterprise, Lilitha Guesthouse, Growing Free Laundry & Dry Cleaning and KwaNdosi. Their success saw them branch off to register the company as an independent entity that has its own premises in Oxford Street. Within a three-month span, they managed to get the business to sustain itself and make reasonable profits. They have also been fortunate enough to sponsor organizations like Youth Impact, an NGO that works with the youth. When I asked the pair, what sets them apart, it was clear that their innovative spirit was the driving force behind the business. Sibulele spent the greater part of his spare time studying code which led to him developing a prototype for an app. “Apps are solutions to problems, and I am always thinking about what’s next, how can we do things better,” says Sibulele. He is always piloting aerial advertising for his clients, something not offered by marketing companies in East London. Sibulele and Ntomboxolo’s vision far surpasses East London, they want to be a major player nationally and see themselves employing other young people. “Companies want you to be established with years of experience but I would give an opportunity to someone young, give them the opportunity to prove themselves,” he says. What stands out about this due to their drive to transform communities and mind-sets, We look forward to seeing them grow and take on the world.